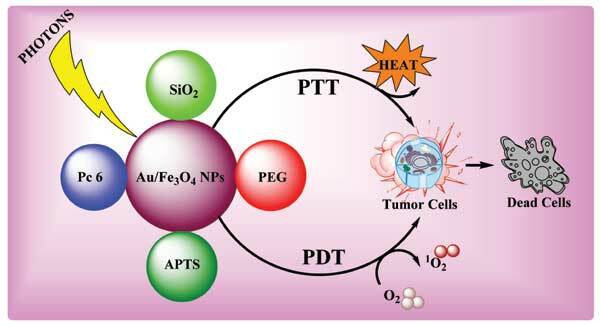 With the progress of nanotechnology, the treatment of cancer by photothermal therapy (PTT) and photodynamic therapy (PDT) using theranostic nanomaterials based on iron oxide (Fe3O4) and gold (Au) nanoparticles (NPs) has received much attention in recent years. The Fe3O4 NPs have been used as imaging-guided PTT of cancer due to their high relaxivity, excellent contrast enhancement, and less toxicity. The Au NPs have been widely employed as a contrast agent for CT imaging of different biological systems due to their enhanced X-ray attenuation property. Due to the strong surface plasmon resonance (SPR) absorption intensity in near-infrared (NIR) region, Au NPs have been considered for imaging-guided PTT of cancer. Since the photosensitizer, which plays an important role in PDT of cancer, can be efficiently conjugated with Fe3O4 and Au NPs, these NPs have also been considered for imaging-guided PDT of cancer. It has been found that both Fe3O4 and Au NPs allow passive targeting of tumors through enhanced permeability and retention (EPR) effect to improve the treatment efficacy in PTT and PDT. The present review focuses on the recent developments of Fe3O4 and Au-based NPs as theranostics for imaging-guided PTT and PDT of cancer. Theranostics, Tumor, Iron oxide, Gold, Photothermal therapy, Photodynamic therapy.